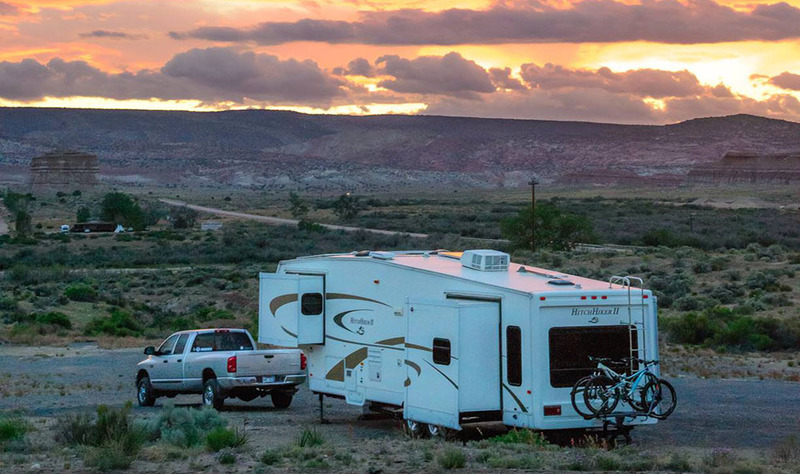 Getting away from it all and camping on America’s beautiful public lands is wonderful, and the ability to do it with all the luxuries of home in an RV is even better. My husband, Mark, and I have been dry-camping in various RVs for more than a decade, and we’ve learned a lot over the years about how to boondock or “wild camp” in comfort and style. Living in an RV without hook-ups to power and water requires a few adaptations, but they are easy. If your boondocking plans are to escape to the great outdoors for a night or two every now and then, you may not need to make changes to the electrical system in your RV. Conserving electricity and avoiding the use of big household appliances, such as the microwave, hair dryer and vacuum, may make it possible to run the RV from its batteries for a night or two at a time. However, if you plan to dry-camp frequently and for extended periods of time, then upgrading the battery bank and investing in solar power and an inverter will make it possible to recharge the batteries silently, without gas or fumes, and to run all the household appliances as well. We have published several articles about solar power, RV batteries and power inverters in previous issues of Escapees magazine (“Solar power”: May/June and November/December, 2015; “Batteries”: January/February 2016 and “Inverters”: November/December 2016). There are many ways to conserve electricity while boondocking. At night, we turn off lights that aren’t actively being used. We keep our bedroom lights off while we’re in the living room and we use only one overhead light at a time. We also keep our trailer’s exterior lights off. Coffee makers use a huge amount of electricity, but it is easy to make a gourmet cup of coffee without using any power at all by boiling water in a kettle and pouring it over the grounds in a Melitta-style filter. Also, higher volumes on the TV use more power than lower volumes, especially if the entertainment system has surround-sound and a big subwoofer. Running our laptops from their own batteries helps us conserve electricity. I always charge my laptop in our truck using a small inverter as we drive around so we don’t have to run our RV’s house inverter off our house batteries as much. In our first year of full-time RVing, before we installed an adequately sized solar panel array on our trailer’s roof, we charged our toothbrushes and two-way radios in the truck and used oil lamps, too. LED lights use less power than conventional incandescent or halogen lights, and fluorescent lights use slightly more than LEDs. It is expensive and unnecessary to replace every single bulb in an RV, so we replaced only the few that we leave on for hours at a time. When we replaced our 12-volt RV incandescent bulbs with LED bulbs, we swapped out the dual bayonet-mount bulbs in each fixture for two 400-lumen LED bulbs to get a comparable amount of light. The pair of LEDs drew a little less than one amp, whereas the incandescent bulbs drew about two amps. LED lights come in various colors, classified by degrees Kelvin. The bulbs that cast a warm light similar to an incadescent bulb are in the 2,700 to 3,200 Kelvin range. Kelvin values of 4,000 and higher are very white or even blueish. Conserving water is also easy. Our biggest water use is our shower and, over the years, we have mastered the art of the one- or two-gallon shower. If the water is coming out warm, we wash from the top down (hair first) to make the most of every drop of water. If the water is coming out cold, we wash our feet and legs first and then go top down, because our lower extremities can take the cold better. We turn off the water while lathering up and shaving, and when we wash our hands and faces at the bathroom vanity, we turn off the water while we suds up. The kitchen sink is the next biggest drain on our fresh-water supply. Smaller campers have smaller sink bowls, but most big motorhomes and fifth-wheels have a residential-size kitchen sink with a large basin. Washing dishes in a smaller bowl, or in a pot we used for cooking, set inside the sink, gives us adequate water depth without filling the entire sink. For rinsing, we use a fine trickle of water from the faucet instead of running the water full force. It’s nice to wash the rig at a big car wash or with a hose and lots of pails of soapy water. When boondocking, we get a kick out of washing the rig during or after a downpour. We put two five-gallon pails under our awning and gutters and let them fill with rain water. If the rain stops, then one pail is for soapy water and the other is for rinsing. If the rain continues, however, we put on our raincoats as we wash the rig and let the rain do the final rinse. The beauty is that rain water doesn’t leave spots! There are RV dump stations in almost every town, either at public campgrounds, private RV parks or truck stops. Escapees members can find them listed in the Day’s End Directory, and there are other lists online at www.sanidumps.com and www.rvdumps.com. Sometimes they are free, but usually they cost any-where from $3 to $15. A few basic tips for dumping the waste tanks are to wear disposable rubber gloves, empty the black tank first and then the grey tank so the rush of grey water rinses any black-water remnants from the sewer hose, and to hose down the area with fresh water after you’re finished so it’s tidy for the next person. Before we attach our drinking-water hose to fill our fresh-water tanks, we spray the spigot with bleach. Using an inline water filter helps reduce contaminants that might be in the water, especially for folks who drink the water that is in their fresh water tanks. We don’t drink the water from our holding tanks. Instead, we refill 10 one-gallon drinking water bottles at Glacier, Culligan and other water-refill stations that are found at supermarkets. Many RVs have more grey- and black-water holding-tank capacity than fresh-water capacity, so after a few days of showers and dish washing, the fresh-water tanks are slightly depleted but there is still lots of room in the waste-water tanks. Our 36-foot fifth-wheel trailer has 78 gallons of fresh-water and 128 gallons of waste-water tank capacity. 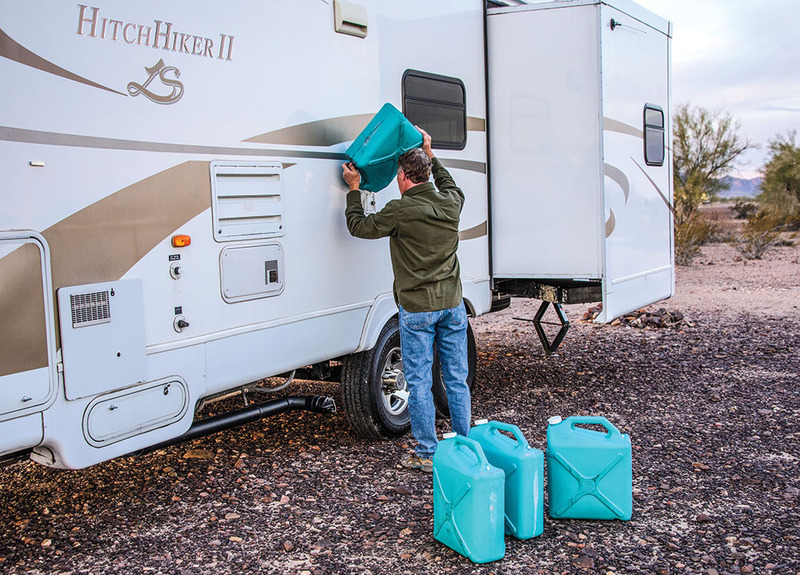 It has a gravity-fill water intake on the outside, so we carry four six-gallon water jugs in the bed of our truck and replenish our fresh-water tanks with them. Propane is essential for most RVs that aren’t plugged into electrical hookups, because it powers many of the biggest appliances in the absence of shore power. Many RVs are equipped with a refrigerator that runs on propane when there isn’t a power hookup, and most have a water heater that runs on propane as well as a propane furnace, too. It is also easy to install a vent-free propane heater. So, conserving propane while dry-camping can be important. Rather than running our water heater all day, we turn it on only once a day for 10 minutes or so before we take showers. We also insulated both our water heater and the hot-water pipes in the basement of our trailer. This way, the water stays warm a little longer, both in the tank and all the way up to the faucets. Of course, after 24 hours, the water in the pipes leading to the shower is cold because that water hasn’t moved since our previous day’s shower. So, the first quart or so of water is cold. This is fine in the summertime, but miserable in the dead of winter. So, we capture that first quart of cold water from the shower nozzle into a sauce pan and put it on the stove. When it comes time to wash dishes, we heat up the sauce pan of water and pour it into a bowl in the kitchen sink. This becomes our sudsy dishwashing water. We then rinse the dishes with water from the faucet which may be either warm or cold. 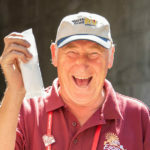 When we dry-camp in a national forest campground or in a dispersed camping location, it’s usually not possible to rely on a public WiFi hot spot to access the Internet the way we can while at an RV park offering WiFi as one of their amenities. Instead, we use a Verizon MiFi Jet-pack with a monthly data-only plan. This device uses the cellphone towers to access the Internet and broadcasts a private WiFi signal inside our rig. Our laptops then connect to the Verizon MiFi Jetpack via WiFi. Similar to living in a house in a neighborhood, or in an RV in an RV park, we take precautions so we don’t invite trouble when we boondock. We lock our front door at night and when we leave for the day, and we lock the fifth-wheel king pin so the trailer can’t be towed away while we’re gone. We lock our bicycles to a leg of the trailer or onto the bicycle rack where they are mounted on the back of the trailer, and, depending on where we are, we put away our grill and camp chairs when we leave for the day. We also use cable locks to secure the valuables we carry in the bed of our truck to the truck itself. We both grew up in major cities, so we rely on our city slicker’s “sixth sense” to keep an eye on our surroundings, and we listen to our gut feelings and hunches. If we do not feel comfortable in an area, we don’t stay. We don’t carry a gun, and we have never seen a bear or other large carnivorous animal near our RV. 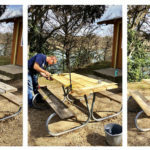 If you have been curious about dry-camping in your RV, either at a state park or national park campground that doesn’t offer hookups, or in a dispersed campsite on public land, hopefully, these tips will help you enjoy the wild camping experience in comfort. 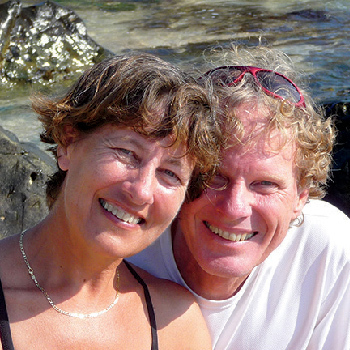 Emily Fagan and her husband, Mark, have been traveling full-time by RV and sailboat for over twelve years. You can find more information about the dentists they visited on their blog: roadslesstraveled.us. Picking up 6 gallon water jugs to refill your fresh tank is difficult for a lot of people. A much better solution is from Amazon or camping World you can buy a water bladder and it will fit in the back of the truck or the roof of your vehicle you go and fill it put it on the roof carefully drive back to wear your camp. And using an old water pump pump from the bladder into your storage tank. Seann’s idea of a water bladder is great for larger rvs. Eight years ago I decided I needed a way to fill my 75 gal fresh water tank for boondocking, but the 45 gal vinyl water bladder from Camping World was too small, so I contacted the company that makes it for Camping World, New World Mfg in Cloverdale, CA & they offered to make me any size I wanted. I had one made to fill the space in front of the 5th wheel hitch. It expands about a foot high & holds 90 gal. I use a 120V AC water pump from Harbor Freight , about $75, to pump the water form the truck to the rv. I also use a macerator to pump waste water up into my 35 gal waste tote which I carry between hitch & tailgate. I can empty the tote from the truck bed without taking it out of the truck. As a result, we never have to move the rv when boondocking for extended periods. My truck fetches the fresh water & removes the waste water, even if the dump station is miles away, like in the Southwest desert. I have done Boondocking for many years while gold prospecting.. I have a solar system that charges my Batteries and I have 60 gallon of fresh water on board and 40 gal on the truck for panning the gold and other stuff, as for the propane 2 8 gal tanks witch get topped of after every trip as it runs an 8 k genny when needed (Maybe ran 3 times in the last year) and my fridge and stove. My trips average 2 weeks with 1 day supply run back in to town. We mainly stay from ft Stockton TX to Yuma AZ, El Paso Tx (Home Base) to Lubbock TX and Albuquerque NM, So as you can think we do not have many nice places like RV parks to stay in. We do have TV and Dish if we want to watch a show. Other then that we just enjoy each other and talk a lot and play cards. I can’t imagine that huge 5th wheel in the photo being towed by that pickup.